Updated from the archives. Originally posted Jan 24, 2009. Quesadillas are one of the quickest lunch or supper items to make and quite versatile. I've been crazy busy with wrapping up preschool, and I've been making quick meals like this when I'm strapped for time (and it's so simple I even had my husband whipping these up for us). This version which doesn't use any salsa I discovered in my first year of college at Moxie's. 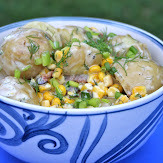 I loved the smoky, rich BBQ flavor combined with the pops of sweet corn and cool sour cream. Luckily I perfected the recipe at home years ago because they have since changed the recipe on their menu. I prepare for a quick meal like this by either picking up a roasted deli chicken the day I buy my groceries, or I will schedule a roasted chicken on my menu plan (like this one or this one) to eat the first night and then use up the leftovers in this dish the following night. When I buy whole chickens I get a better deal if I buy the packages with two or three chickens in it. I'll bring that home and roast two chickens at a time, specifically to make recipes that call for shredded chicken. I'll keep it simple and do a lemon herb one and slather one in BBQ sauce and then roast them at the same time. You can make amazing soup this way and have a container of shredded chicken for quick meals like these full of flavor quesadillas. With just a little forethought you can be eating a fantastic and easy meal on a busy weeknight. In a large saute pan over medium heat dump in the chicken, corn, black beans, taco seasoning and water. Stir and let it cook down until most of the water has evaporated. Remove from heat. Heat a large frying pan over medium-high heat. Spread a thin layer of butter over one side of the tortilla and put the butter side down into the hot pan. On one half of the tortilla, squirt about a tablespoon of BBQ sauce and top with a sixth of the chicken/bean/corn mixture. Add a generous sprinkling of grated cheese (about 1/3 cup). Fold the other half of the tortilla over all the filling and cook until the underside gets brown and crispy. Flip the quesadilla over and let cook until the other side is also brown and crispy. If your quesadilla is browning too quickly before all the cheese is melted, turn the heat down to medium. Remove from pan, cut into wedges and serve with sour cream and extra BBQ sauce if desired. These are pretty much the only quesadillas my husband and I make because we like them so much. I am a bit of a BBQ sauce snob when it comes to these though, and I think that ONLY Bullseye Grilled Onion BBQ Sauce will do (although in recent years I've discovered the Beer Chipotle one and love that too). Probably because the flavor so closely matches Moxie's original recipe. It's rich and deep flavor is perfect in my opinion. This is also a really great way to use up leftover turkey from Thanksgiving or Christmas. The flavors are so different from holiday fare, its a nice change up for the palate. And what's with the name "Baja" you ask? I don't know. It just sounds good doesn't it? And besides...that's what Moxie's called it. Use leftover chicken/corn/bean filling to make taquitos using this method. For serving a large group, instead of making the quesadillas you could make flautas instead. Add the BBQ sauce to the chicken/corn/bean filling and make flautas using this method. I just recently came upon your site and this is the first dish I made. Loved it! Looking forward to making more of your meals. Lisa - awesome, I'm so glad you liked it! I used to love these at Moxies, now their whole menu is different. I just remembered them the other day and wondered if I could find a recipe, I'm so glad you wrote this post - thanks! I love eating Quesadillas too. It tastes and it's also healthy and affordable. Those look amazing!!!! I am going to try to make these for my husband he would love them. Thanks for sharing. I just finished making and eating these. Used your recipe exactly. Wow, loved loved loved them!!! You saved my day! What a great hit!